I had imaged this rare asteroid with tail in January but wasn't sure I had even captured it until I just processed and stacked the exposures. It's faint but clearly present in this shot. This is with EdgeHD11 at f/7 and asi1600 with Sloan g' filter. I think the collision had happened in October so I wasn't sure it was still visible in Jan. But others had imaged it in Feb. - so it may still be imageable. Anyway - pretty rare event. Edited by freestar8n, 12 March 2019 - 06:43 AM. 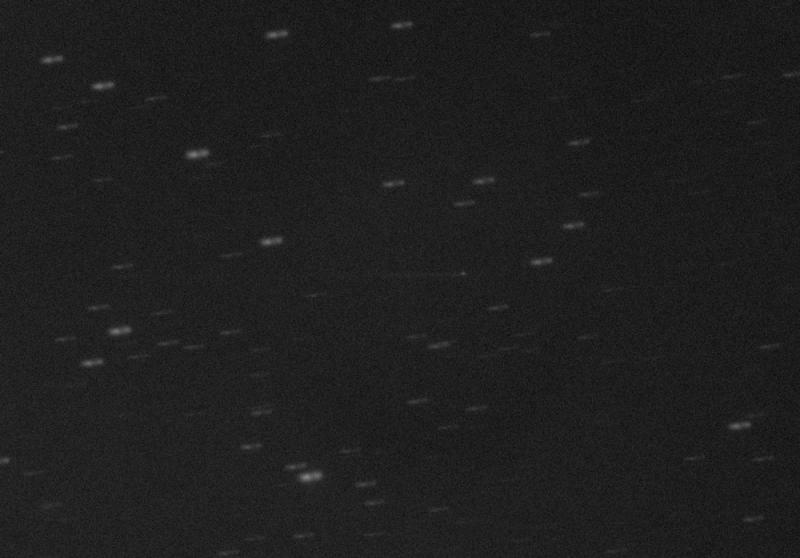 I imaged it on Feb 24th and a tail - maybe even both tails, were still visible. And yeah, it moves fast, so unless you're a 1m telescope under black skies you need to align on the asteroid! Yes I saw word of an extra tail being sprouted. I thought the news about it had quieted down in Jan and I had no idea it was still so active. That's why I thought I might not even have caught it in late Jan. I didn't expect it to be so sustained but I guess it isn't too surprising. My choice of the g' filter - in the blue - was partly to help block out reddish light pollution in my area. I probably should have just used r' or C.
Nice work. I've caught this one a couple of times before the movement really went up. I'll try to revisit it again when I have clear skies. Wow that is faint. Nice capture Dr. Frank. I don't think it's as faint as it seems in my image - and the faintness is mainly due to the blue g' filter. So if people are interested they should give it a try. It is several arc-minutes long so should show up in even a wide field, fast imaging system. But if it does have a second, small tail then long exposure and high res. would be good. It's pretty well placed in Sextans now - so should be in reach of most people. Looking it up again, I'd be down to 80 second exposures tonight, so it is moving quicker. TheSkyX also says mag 17.55. Nice animation, Dan. I just had it in my head that this thing would fade out quickly - but I guess not. It's interesting that just recently the Japanese Hyabusa2 fired a projectile at an asteroid to create a similar kind of event - but on a smaller scale. I will try to image it again if I get clear skies. That’s a really interesting object and a nice capture. Very well done! I don't know of any recent images on the web - so it's hard to compare. I'll see how it goes tonight. It should be clearer. Here is a raw, uncalibrated crop of a single 10m exposure with C filter tracking on the asteroid with Shift-guiding in MetaGuide on CGE-Pro. To the upper right is a faint galaxy nearby, PGC 90996. It has been binned 3x3 to 1.2" per pixel. The background in the image is extremely high, so I think that's the limiting issue here. I'll be interested to see other images around this time. Oh? I didn't realize the cause was uncertain, but the constant supply is exactly what threw me about this thing lasting so long. Cool I will look into it. But I thought this topic had died down because it was all over. Instead it's right up there to be imaged - and still doing things. At least I think it is - but not based on my shot through the milk. How do you guide on the astroid with OAG and what is shift guiding? PS Ah...I looked it up and it appears to be what I guessed. It looks like you have it working pretty well. Edited by jhayes_tucson, 13 March 2019 - 07:07 PM. Thanks - it is a simple concept in principle - but very involved to get it working well. Autoguiding with a fixed centroid is one thing - but when the centroid slowly moves across the pixels at an exact required rate it introduces all kinds of issues - only one of which is getting the signs of the motion directions correct and the speeds well calibrated. But the result is that you can do long guided exposures of moving objects with a mid-range mount. I have had it working and using it for over ten years now. I believe PhD2 introduced something similar recently - but I haven't seen many results. Normally I use it with OAG - but I was doing some other tests so the above image is just guided with a 60mm guidescope - combined with shift guiding. So that is a pretty small and round dot about 2" fwhm in a 10m exposure - with guidescope and sct - and it is moving the whole time. I don't recommend guidescopes for this kind of thing - but sometimes they work ok.
Possible explanation of the mechanism here, from an article in Ciel et Espace. Thanks! Interesting. A rubble pile with changing spin rate. Makes sense. Well - I haven't stacked these images yet but I don't see much activity. I'll be interested to see other recent images of this thing. Their image is from 18x5m exposures at a very dark site and mine is from 14x5m exposures at about an 18.5 mag site - and the moon was a bit larger and nearer for me. 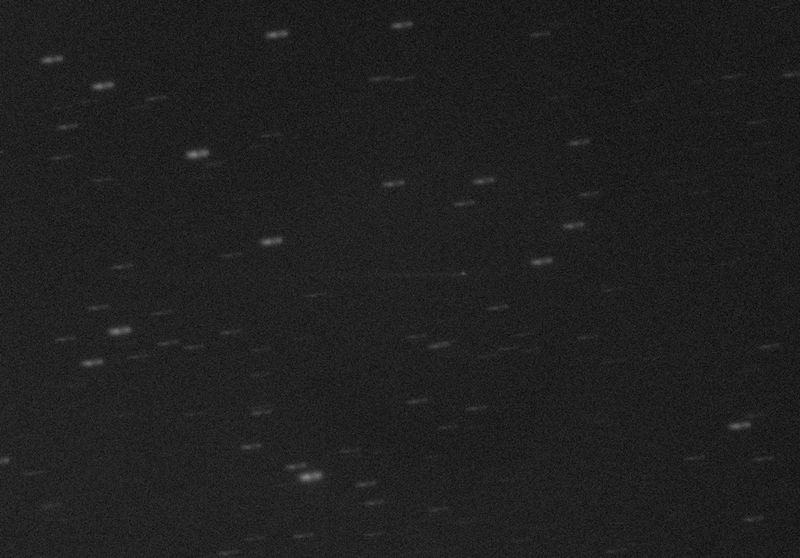 So this object really is pretty faint and benefits from very dark skies. And to capture the small extra tail you need fairly high res. 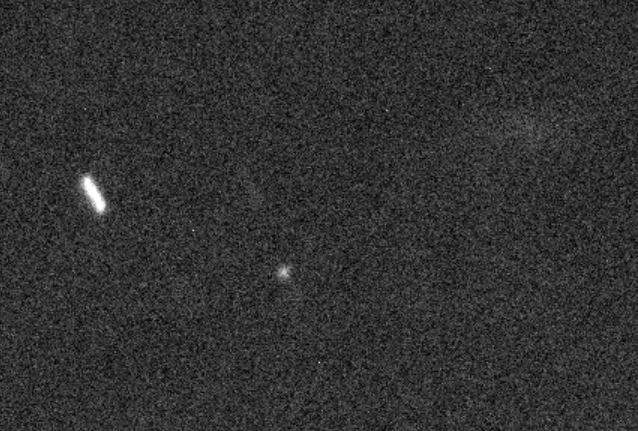 Anyway - there's a fairly unusual rubble pile asteroid spinning and spouting tails. It's getting close to the moon now but I guess may stay active for some time. I think I managed to get the second tail as well but I'm not much of a 'stack on the object' processor. I have a set tracking it and a set tracking the stars. I'll try to recruit someone to stack it. Thanks - I feel your pain. 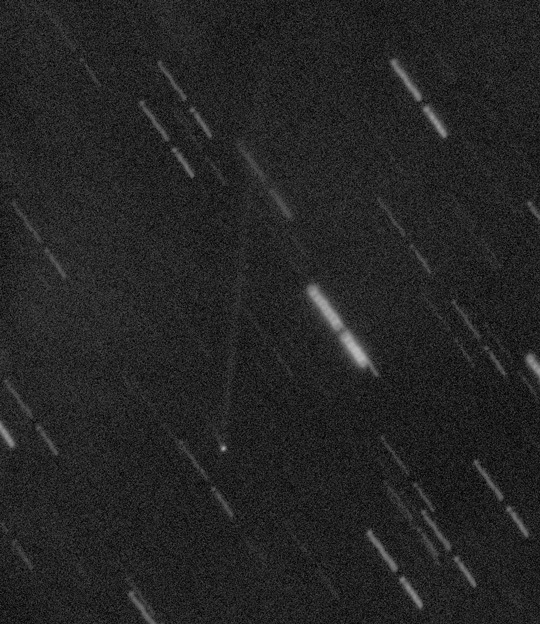 All my calibration and stacking stuff is my own - and I have various ways to track a comet but they don't work well at detecting and tracking the centroid of this one. So I manually found the x,y centroid in each frame and aligned them using simple x/y shift. There aren't too many frames so it wasn't too bad. I just stacked another set from last night that doesn't show the second tail as well - but it is faintly there. The two tails seem fairly fixed in orientation I think.